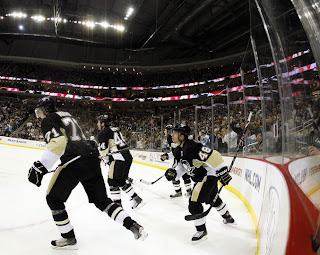 -Sid with a great chance on a breakaway of his own. Takes a hard shot. Roloson stops him. -Now Tampa is buzzing. Fleury stops about 3 rebound chances. -Lovejoy fires from the point. Deflected off Conner's skate behind Roloson. No kicking motion so the goal stands. 2-0 less than 3 minutes in and this is exactly the kind of start the Pens needed after a big letdown followed by a long break. -Still announcing TK goal. Kunitz takes it down the left side and wrists it right past Dan Ellis. Great shot. 4-0 Pens. -Conner rings one off the goal post at 11:30 mark. Clearly beat Ellis but Dan was saved by the pipe. -Sid line out. Sid is trying to get himself on the board as well but Ellis all of a sudden looks sharp. -Gagne rams into Fleury with 2 minutes to go. Fleury knocked back into his net but the puck stays out. -Pens powerplay. Letang with a beautiful spin pass to Goligoski. Goligoski fires it off the stick of Kunitz and in. Kunitz on HT watch. 5-0 Pens with 1 minute to go. -Downie takes another penalty. Pens will start the next period with a minute of PP time. Notes: Best period of the season as far as I can remember. Hit them before they even knew what was going on and never stopped. The new lines look great, especially the new buzz line. Chris Conner is unreal so far. I don't think I'd be out of bounds to call this one long gone already. Pad your stats a bit, rest up for Montreal tomorrow. -Roloson back in net to start the period. -Lightning kill off the rest of the Pens powerplay. -Lovejoy trips up Stamkos on a semi-breakaway. Penalty shot called, should have only been 2 min. Stamkos loses an edge on his penalty shot attempt and harmlessly slides across the Consol Energy Center ice while Fleury easily scoops up the sliding puck. It's been that kind of night for TBL. Still 5-0 Pens. -Rupp and Downie take 2 min minors. 4 on 4 now. Tampa looks better but Fleury is holding the fort. -Orpik with a great centering pass at the end of the 4 on 4. Kennedy just pokes it wide. -Kunitz breakaway at the 10 minute mark. Tries to go backhand but Roloson closes his legs. -Fleury with a great save on Malone with 3 minutes to go in the period. Notes: Just going through the motions. Sick move by Letestu and great to see Kunitz get his 2nd career hattie. Pens defense still rock solid. My only concern is that this game may get a bit ugly and with Asham, Engelland, and Godard scratched I wonder who will have to keep Downie from his usual dirty tricks. -Now Ellis is back in goal. -Michalek and Malone mix it up behind the net. Orpik steps in to help. -Bergenheim runs Adams behind the play and then runs to the penalty box instead of stepping up to fight Craig. -Some hitting, some shooting, but no goals. -Its over. 8-1. See you tomorrow! Notes: Kept it clean. Would have been nice to see Fleury get the shutout but I don't think he's that upset. Bylsma was still coaching them rather hard from the bench and made sure that the defense stayed sharp throughout the third. But it was pretty much a victory lap. -I know the first thing that comes to everybody's mind when they see the scoresheet is "Where's Sid?" He did get 1 assist but that was it. Sid looked pretty good in the beginning of the game but really was absent in the final 2 periods. I don't know if he was just taking it easy because of the circumstances or if he was still hurting from that Steckel blindside hit back at Heinz Field but either way Sid was nowhere near 100%. It's obviously not a big deal tonight but we'll see how he does against the Habs. -Alex Goligoski's best game of the season. He looked confident back on the powerplay and set up both of Kunitz's deflection goals with beautifully placed slapshots. He also got a goal of his own later on a breakaway and his defense looked good. -Chris Conner really made a strong case not to scratch him again any time soon. He was absolutely flying out there and his stats back him up (not to mention he should have had another goal but it hit the post). -Kennedy made the best of his golden opportunity next to 2 of the game's best. The Bolts defense concentrated on 71 and 11 all night and allowed Kennedy to make plays. -Cooke fit right in on the buzz line. -Kudos to Fleury and the defense for staying sharp all night. "We had no juice, nothing, and they had everything." -This one never changed. Pens dominated from the first drop of the puck.